In this schism between environmentalists, Pinchot won and the dam was built. To this day, preservationists want the dam removed. The real loser, they would argue, was nature. The Hetch Hetchy Valley before and after the dam. Images via Wikimedia. Well, 100 years later maybe it’s time for payback. A huge fire is currently out of control in Yosemite, and California has declared a state of emergency not just for the immediate area, but for San Francisco, 140 miles away. The reason? The city’s electric and water supplies may be in jeopardy. 85% of the city’s water comes from the Hetch Hetchy Reservoir, which may get contaminated with smoke and ash, and, furthermore, there are major electrical transmission lines in the, um, line of fire. I haven’t read whether the cause of the fire has been determined, if it was natural or human, or whether forestry policies contributed to its spread. But the potential irony is there. Muir and nature may have lost the initial battle, but the war – which is how some still see our relationship to nature – is far from over, and nature, provider of oxygen and water and a few other life essentials, holds a stronger hand than we do. One wonders how long that “long run” of Pinchot’s wise use is. 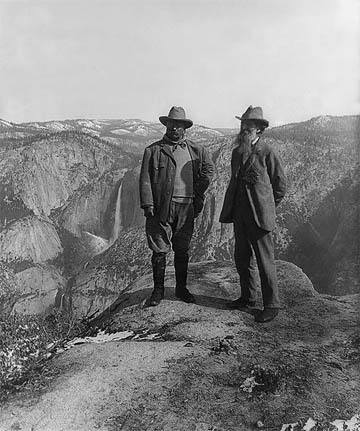 This entry was posted in Nature, Politics and tagged John Muir, Theodore Roosevelt on August 26, 2013 by David Bergman.